The news of Abraham Lincoln's assassination on April 15, 1865, just days after Confederate surrender, astounded the war-weary nation. Massive crowds turned out for services and ceremonies. Countless expressions of grief and dismay were printed in newspapers and preached in sermons. Public responses to the assassination have been well chronicled, but this book is the first to delve into the personal and intimate responses of everyday people-northerners and southerners, soldiers and civilians, black people and white, men and women, rich and poor. 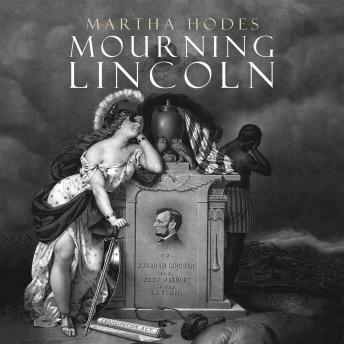 Through deep and thoughtful exploration of diaries, letters, and other personal writings penned during the spring and summer of 1865, Martha Hodes, one of our finest historians, captures the full range of reactions to the president's death-far more diverse than public expressions would suggest. She tells a story of shock, glee, sorrow, anger, blame, and fear. ''Tis the saddest day in our history,' wrote a mournful man. It was 'an electric shock to my soul,' wrote a woman who had escaped from slavery. 'Glorious News!' a Lincoln enemy exulted. 'Old Lincoln is dead, and I will kill the goddamned Negroes now,' an angry white southerner ranted. For the black soldiers of the Fifty-Fourth Massachusetts, it was all 'too overwhelming, too lamentable, too distressing' to absorb. There are many surprises in the story Hodes tells, not least the way in which even those utterly devastated by Lincoln's demise easily interrupted their mourning rituals to attend to the most mundane aspects of everyday life. There is also the unexpected and unabated virulence of Lincoln's northern critics, and the way Confederates simultaneously celebrated Lincoln's death and instantly-on the very day he died-cast him as a fallen friend to the defeated white South. Hodes brings to life a key moment of national uncertainty and confusion, when competing visions of America's future proved irreconcilable and hopes for racial justice in the aftermath of the Civil War slipped from the nation's grasp. Hodes masterfully brings the tragedy of Lincoln's assassination alive in human terms-terms that continue to stagger and rivet us one hundred and fifty years after the event they so strikingly describe.